Olunike Adeliyi is a film, television and theatre actress whose resume is as diverse as she is talented. Olunike was introduced to us from her role as Leah Kerns on the popular Canadian television show, Flashpoint. 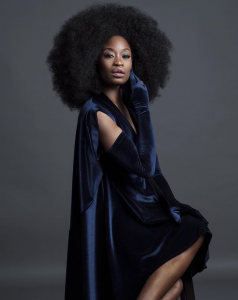 Coming from a theatrical background, Olunike has gone on to play a variety of roles in films such as BOOST and Darken and television shows like Workin’ Moms. Inspired by her role as a mom, Olunike seeks to do more than make a living, but works to leave the world better than she found it. CEOMOM caught up with Olunike to talk about how she got into acting, her upcoming roles and what it means to be a working mother. Your big break was Flashpoint where you played Leah Kerns. Did you always want to be an actress? I am pretty sure I’ve always wanted to be an entertainer of some sort. I started young in my grandparents’ church in Jamaica doing a lot of performances during harvest and Easter. From there, my love for performing took on a life of its own. It was something that was fun for me to do. My grade six music teacher saw that I was very animated and a very hyper child. She suggested that I audition for the school play. I did and ended up getting the lead role in the Princess and the Dragon. l acted all through junior high and high school. When I got out of high school, I continued touring in dance troupes and doing background work. While doing theatrical work I got some inspiration from Denzel Washington who told me to focus on one thing and make it really great and the other talents will follow. He asked me if I ever thought about studying in New York. I applied and attended the American Academy of Dramatic Arts. Upon graduation, I came back to Toronto and everything else is history. I started in theatre because that was my educational background. At the end of the run of one of my plays, Flashpoint called me in for an audition and I nailed it. Acting is something that found me because I love it so much. It is an art form that keeps me alive and interested in humanity. You are an accomplished actress with roles in television, theatre and film. Which are you most passionate? I don’t know. If I had to choose, I think I would be most passionate about theatre, however I am passionate about all three avenues of art. They all bring different elements to the work. I love theatre, because of the writing. All of the characters are heroes and they express themselves fully. They say the things you want to say and do the things you want to do without fear of consequence. I love TV, because you get to try out different characters more frequently and learn the art of speedy dialogue and filming. If you are a recurring or a regular character you get to play with different artists every episode and support their work. It doesn’t get boring when you’re serving other artists. I also like the family aspect of television. You get to work together for many years to make this piece of art that will stay in the universe forever. You also get to play characters that are more like yourself. Film is a slower medium where you live with the characters for an extended period of time, before and after the filming process. With film, I get to build from animal work, sensory work, and private work to really align the mind, body, and soul of the character. Congratulations for your Canadian Screen Award nomination for Best Supporting Actress for your role in BOOST. As a mom, how did you prepare for the role of Amina? Amina was based on my own mother, who immigrated to Canada. I reflected on her experiences, the good ones, the not so good ones and the obstacles she had to face being in a land that was not her own. My mom said she felt a sense of loneliness being one of the first ones of our family here in Canada. She eventually got married and had a family. My mom is from Jamaica and my dad is from Nigeria. My parents spoke a lot about coming to a new land. When you come to a new land you want to be a part of it all. You want to feel like one of the natural born citizens, but you are not. I also drew from being a mom myself. My daughter is a young adult and in university. Just raising her and observing her has been a delight. I had to draw off of my role as a mom who works to make sure my daughter is supported and has a roof over her head. I wanted to make sure she understood humanity and developed good character. That means more to me than the money you make. Amina wanted her kids to be good people. Staying on a straight line, putting your heads down in those books, and taking care of each other. That was Amina’s way of surviving in Canada. Workin’ Moms is a hilarious take on the many roles moms play while trying to maintain a sense of self. Why do you think a show like this is so important? How is it helping to push conversations about having it all? The show is really good. It is about women trying to have it all. Workin’ Moms aims to portray the reality of “yes we can do it all to a certain degree, but not all at the same time”. When you become a mother you have taken on a whole other job other than being a career woman and a wife. It is possible, but it comes at a really high cost. A lot of things are sacrificed. I like how Catherine Reitman, the creator and writer, is able to make the show relatable by presenting important conversation that affect women on a daily basis, but also draws extreme humor from the subject matters. Can we really do all of this? Yes and no. I love the show’s content that we get to play with, for example, the relationship between me and Juno’s character who are in a gay marriage. It’s about a regular relationship and the challenges you face in marriage when trying to connect to someone you support and love so deeply, but also dying to strangle. I love that normalcy about it. Workin’ Moms has been green lit for season 3. It is really picking up steam and doing incredibly well. In addition to being an actress and producer, you are a philanthropist. Tell us a little bit about your philanthropic projects. I have a showcase called Monologue Slam Canada. We have created this monthly event where we have actors in the community battle it out in front of an audience with any monologue of their choice. I am bringing the talent to the judges who are industry professionals. It is a really great networking event that has been going on for seven seasons. We keep expanding it to bridge that gap for actors, whom audiences don’t get to see. I have created a venue where the casting directors, producers and writers can come and see local talent that they are not familiar with and possibly hire them. We have a lot of actors getting great work through this medium. I also travel with my group, Third World Awareness, to bring supplies for our schools and kids in Haiti. We worked with them to develop a new arts program. It includes stenciling and writing which is a lot of fun for the children and teachers. The kids have really gravitated to us being there. We are a grassroots group that goes to help the Haitian community as best we can, but never imposing ourselves as saviours. The group has also traveled to Nicaragua and Jamaica with Haiti being the main focus. Our group also involve ourselves in the Haitian community and learn their history, traditions, and customs. We really enjoy our experience with the rich culture of Haiti. Volunteers are always welcome. Visit www.twawareness.org. I have the sci-fi film Darken, directed by Audrey Cummings, coming to theatres soon. It takes place in a sort of labyrinth world where nothing seems as it is. The maze like world transitioned to a dark and dangerous society when a dictatorship takes over. The main characters end up trying to get out of the Darken and have to continuously run for their lives. It’s really exciting and exhausting. I am also starring in the film Parting Glass, directed by Stephen Moyer. It is written by and stars Denis O’Hare, along with other incredible actors like Melissa Leo, Anna Paquin, Ed Asner and Cynthia Nixon. It is a beautiful story about a family going through a sudden traumatic event. Another film I have coming up is Chaos Walking directed by Doug Liman, starring Tom Holland, Daisy Ridley, David Oyelowo, Cynthia Erivo, Mads Mikkleson, and Nick Jonas. It’s a really fun cast. Good interview, good to get a perspective on the background of your start up into acting. Carry on the good work Wendy. I Thoroughly enjoyed reading your interview. Good luck in all that you do.